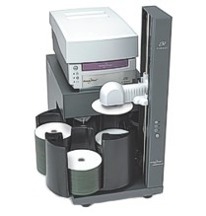 If you are looking to release a CD music album the CD replication process is the most suitable manufacturing option. All music albums available in high street music stores will have been manufactured using this process. This manufacturing process is most suitable for orders of at least 500 albums, set up costs are relatively high due to the glass mastering and production of metal stampers. For any orders of 1000 units or greater these set up charges are free and therefore larger orders are a lot more cost effective. Replicated or “pressed” discs will have a far longer lifespan than a disc that is burnt by means of duplication. Duplicated discs rely on a photosensitive dye that is sandwiched between 2 layers of plastic. Over time and especially if the duplicated disc is subjected to strong sunlight this sensitive dye can begin to breakdown chemically and the result is a loss of data. Replicated discs do not use this dye technology and are therefore not prone to deterioration by strong light and UV exposure, this is the main reason why replicated discs have a far greater life than duplicated discs. If you are looking to release an album commercially it therefore makes sense to use CD replication. This entry was posted on Thursday, December 3rd, 2009 at 12:38 pm	and is filed under CD Replication Articles.